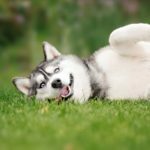 Four common reasons dogs eat grass: they’re bored, nauseous, need nutrients, or they just like grass. Dogs also eat grass if they have ingested something toxic, have diarrhea or if they are constipated. If it’s an occasional situation, then there’s no cause to be alarmed. In most cases, it doesn’t indicate an underlying condition. But you do need to make sure your dog isn’t eating any plants that may contain herbicides or insecticides. If your dog munches on grass frequently and it contains harmful substances, the ingested toxins could eventually reach dangerous levels. If your pup frequently eats grass, consult with your vet. Dogs eat grass if they have ingested something toxic. Dogs eat grass sometimes if they have diarrhea or if they are constipated. Four common reasons dogs eat grass: they’re bored, nauseous, need nutrients or just like grass. 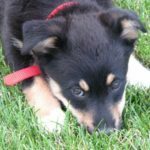 If your pup frequently eats grass, consult with your vet.